LA JOLLA—Every night while you sleep, electrical waves of brain activity circle around each side of your brain, tracing a pattern that, were it on the surface of your head, might look like the twin hair buns of Star Wars’ Princess Leia. The Salk Institute scientists who discovered these circular “Princess Leia” oscillations, which are described in the journal eLife, think the waves are responsible each night for forming associations between different aspects of a day’s memories. “The scale and speed of Princess Leia waves in the cortex is unprecedented, a discovery that advances the Brain Research through Advancing Innovative Neurotechnologies (BRAIN) Initiative,” says Terrence Sejnowski, head of Salk’s Computational Neurobiology Laboratory. Short-term memory of events is stored in an area of the brain called the hippocampus. Long-term memories, however, are encoded in the neocortex. The transfer of memories from the hippocampus to the neocortex is called memory consolidation, and happens while we sleep. Sleep spindles—a type of brain wave pattern known to occur in the earliest stages of non-REM sleep—are associated with memory consolidation. Previous studies showed that the more sleep spindles a human brain exhibits overnight, the more numbers one would remember the next day. But exactly how these sleep spindles related to memory was unclear, and scientists were limited by the fact that electrodes could only detect these spindles at one place in the brain at a time. 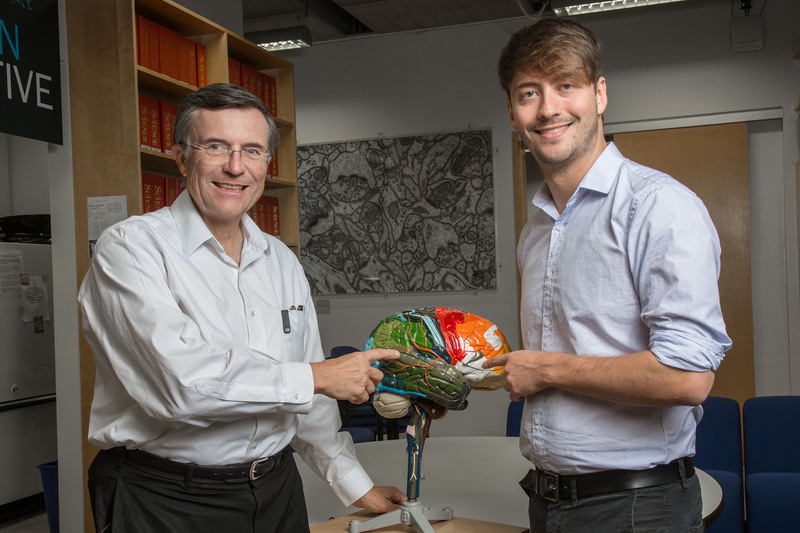 “For a long time, neuroscience researchers had to record activity at one point in the brain at a time and put many data points together without seeing the whole picture simultaneously,” says Lyle Muller, a Salk research associate and first author of the new work. Scientists had long believed that each sleep spindle oscillation peaked at the same time everywhere in the neocortex of the brain. Sejnowski and Muller wanted to see the broader picture, however, and turned to large-scale recordings, called intracranial electrocorticograms (ECoGs), that can measure activity in many areas of the brain at once. Patients with epilepsy often have ECoG arrays temporarily implanted in their brains to determine the location in the brain of epileptic seizures, so the scientists were able to study all the data collected from five such patients on healthy, seizure-free nights. When they crunched the ECoG data from each night, the researchers were in for a surprise: the sleep spindles weren’t peaking simultaneously everywhere in the cortex. Instead, the oscillations were sweeping in circular patterns around and around the neocortex, peaking in one area, and then—a few milliseconds later—an adjacent area. Throughout the night, the researchers observed the same rotating patterns, each lasting about 70 milliseconds but repeating hundreds and hundreds of times over a matter of hours. Why would different areas of the neocortex need to communicate to store memories? One single memory is composed of different components (smell, sound, visuals) that are stored in different areas of the cortex. As a memory is being consolidated, Muller and Sejnowski hypothesize, circular sleep spindle waves help form the links between these different aspects of a single memory. Other researchers on the study were Dominik Koller of the Salk Institute; Giovanni Piantoni and Sydney S. Cash of Massachusetts General Hospital; and Eric Halgren of the University of California San Diego. The work and the researchers involved were supported by grants from the National Institutes of Health, Howard Hughes Medical Institute, the Swartz Foundation and the Office of Naval Research.